Optional Challenge: What Methods Can Be Used on an R Object? 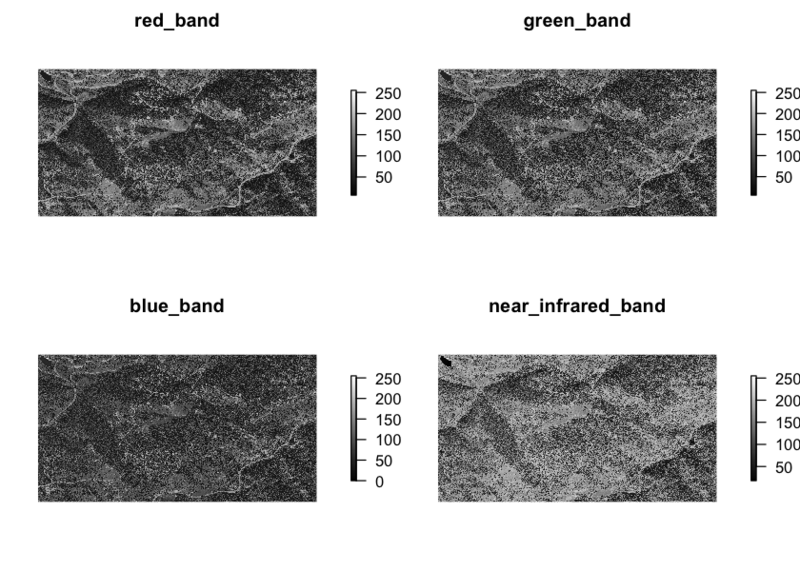 Open an RGB image with 3-4 bands in R using plotRGB(). 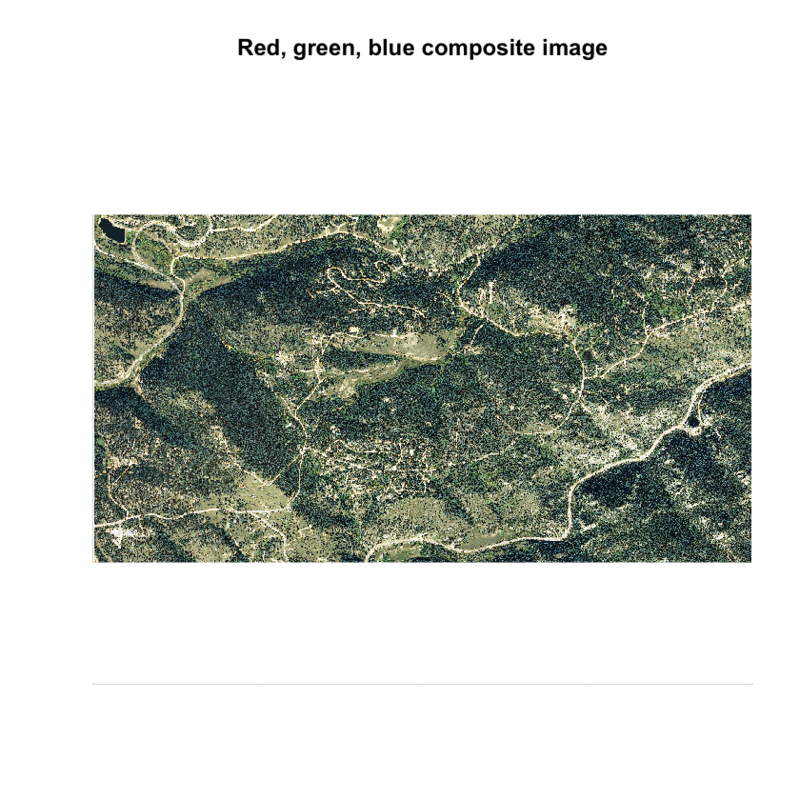 Export an RGB image as a Geotiff using writeRaster(). Identify the number of bands stored in a multi-band raster in R.
Plot various band composite in R including True Color (RGB), and Color Infrared (CIR). In the previous weeks, you have worked with raster data derived from lidar remote sensing instruments. 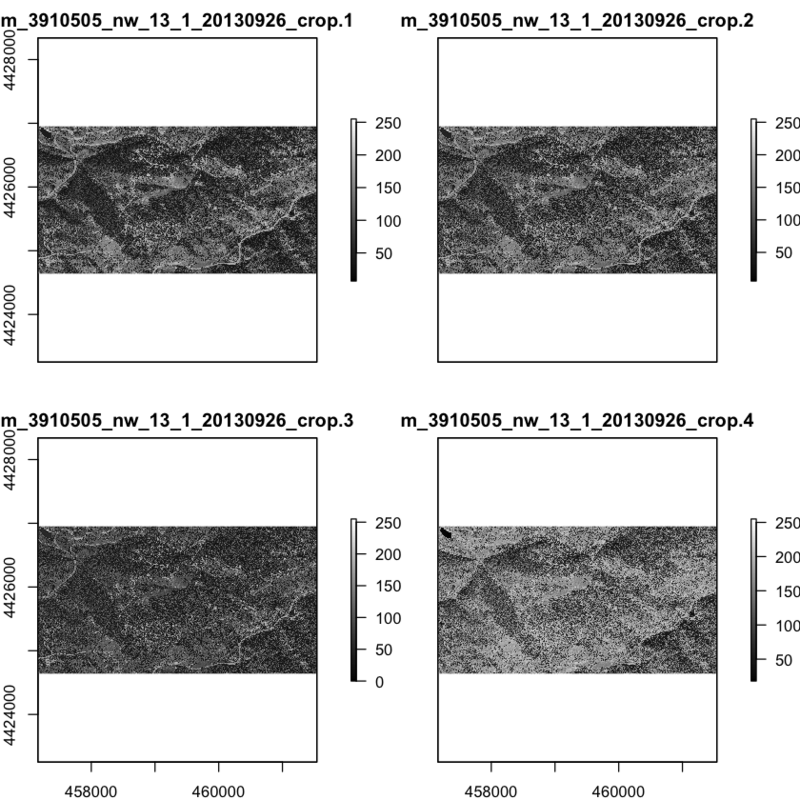 These rasters consisted of one layer or band and contained information height values derived from lidar data. 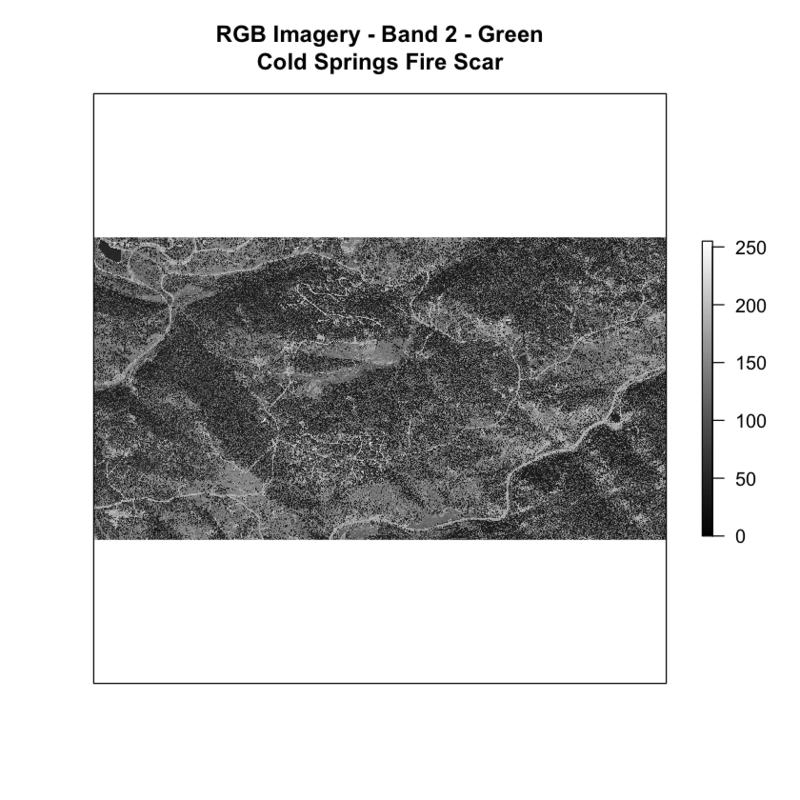 In this lesson, you will learn how to work with rasters containing multispectral imagery data stored within multiple bands (or layers) in R.
Previously, you used the raster() function to open raster data in R. To work with multi-band rasters in R, you need to change how you import and plot your data in several ways. To import multi-band raster data you will use the stack() function. If your multi-band data are imagery that you wish to composite, you can use plotRGB(), instead of plot(), to plot a 3 band raster image. A raster can contain one or more bands. 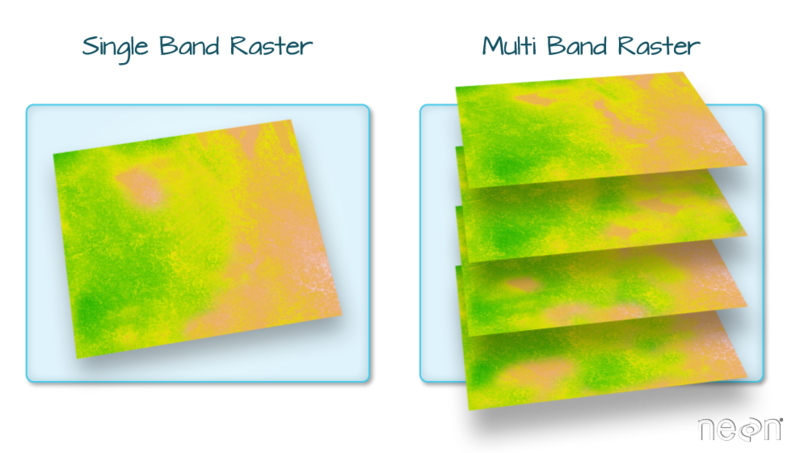 You can use the raster function to import one single band from a single OR multi-band raster. Source: Colin Williams, NEON. One type of multispectral imagery that is familiar to many of us is a color image. A color image consists of three bands: red, green, and blue. Each band represents light reflected from the red, green or blue portions of the electromagnetic spectrum. The pixel brightness for each band, when composited creates the colors that you see in an image. These colors are the ones your eyes can see within the visible portion of the electromagnetic spectrum. A color image consists of 3 bands - red, green and blue. 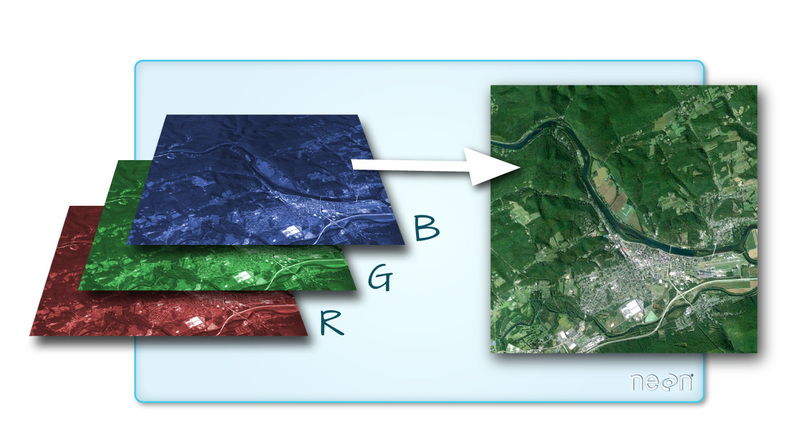 When rendered together in a GIS, or even a tool like Photoshop or any other image software, the 3 bands create a color image. Source: Colin Williams, NEON. You can plot each band of a multi-band image individually using a grayscale color gradient. Remember from the videos that you watched in class that the LIGHTER colors represent a stronger reflection in that band. DARKER colors represent a weaker reflection. Note there are four bands below. You are looking at the blue, green, red and near infrared bands of a NAIP image. What do you notice about the relative darkness / lightness of each image? Is one image brighter than the other? You can plot the red, green and blue bands together to create an RGB image. This is what you would see with your eyes if you were in the airplane looking down at the Earth. Time series data: the same variable, over the same area, over time. Multi or hyperspectral imagery: image rasters that have 4 or more (multi-spectral) or more than 10-15 (hyperspectral) bands. The multispectral imagery that you are using is collected by the National Agricultural Imagery Program (NAIP). NAIP is a great source of high resolution imagery across the United States. 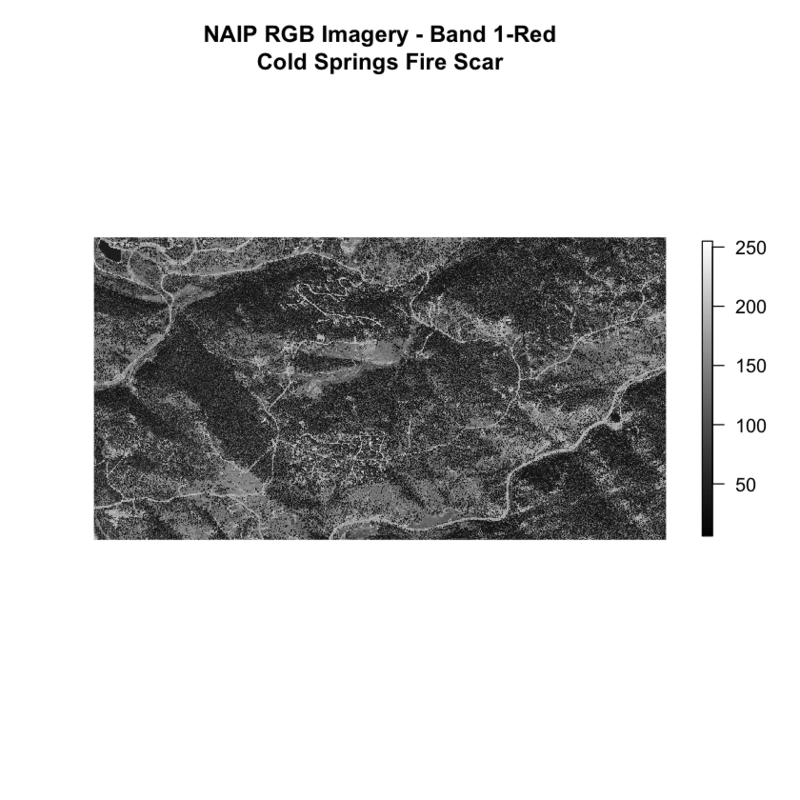 NAIP imagery is often collected with just a red, green and blue band. However, some flights include a near infrared band which is very useful for quantifying vegetation cover and health. NAIP data access: For this lesson the USGS Earth Explorer site was used to download NAIP imagery. Next, let’s explore some multispectral imagery in R. This imagery covers the site of a fire called the Cold Springs fire that occurred in Colorado near Nederland. You will learn more about this fire over the upcoming weeks. 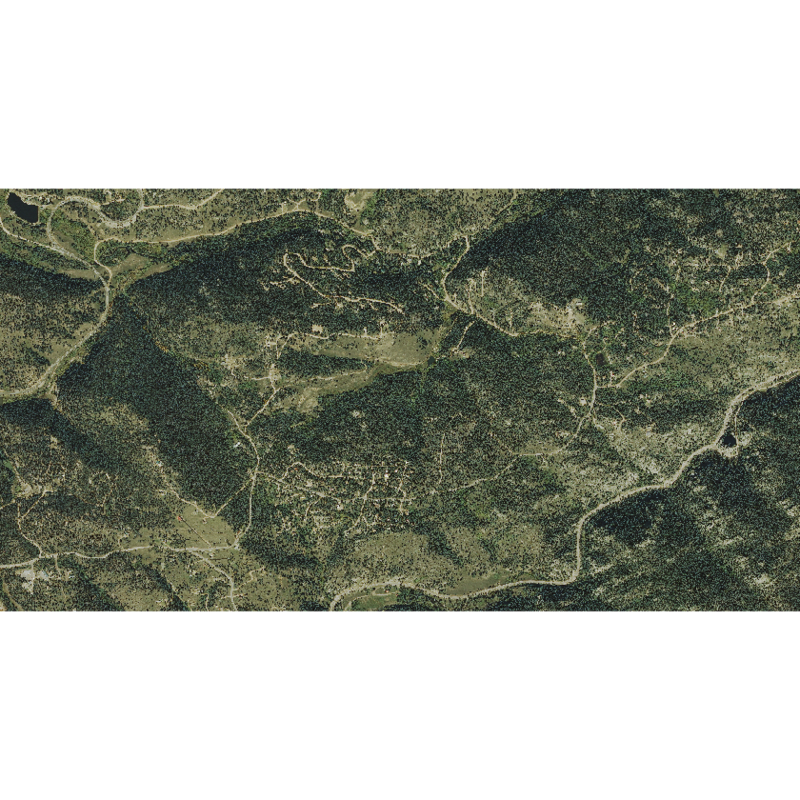 To work with multi-band raster data you use the raster and rgdal packages. You’ll use the rgeos package to crop the data. Next, open up the NAIP imagery for the Cold Springs fire study area in Colorado. # Read in multi-band raster with raster function. # csf = cold springs fire! This is R telling us that this particular raster object has more bands (4 in total). You only imported the first band. 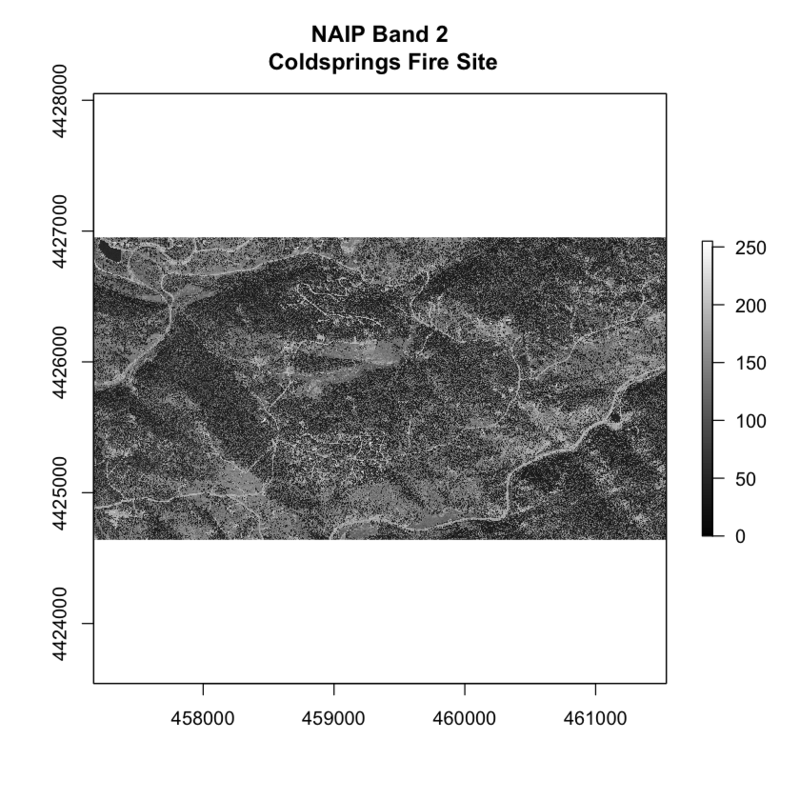 Data Tip: The number of bands associated with a raster object can also be determined using the nbands slot. Syntax is ObjectName@file@nbands, or specifically for your file: RGB_band1@file@nbands. Next, examine the raster min and max values. What is the value range? This raster contains values between 0 and 255. These values represent degrees of brightness associated with the image band. In the case of a RGB image (red, green and blue), band 1 is the red band. When you plot the red band, larger numbers (towards 255) represent pixels with more red in them (a strong red reflection). Smaller numbers (towards 0) represent pixels with less red in them (less red was reflected). To plot an RGB image, you mix red + green + blue values, using the ratio of each. The ratio of each color is determined by how much light was recorded (the reflectance value) in each band. This mixture creates one single color than in turn makes up the full color image - similar to the color image your camera phone creates. You use the raster() function to import specific bands in your raster object by specifying which band you want with band=N (N represents the band number you want to work with). To import the green band, you would use band = 2. Notice that band 2 is the second of 3 bands band: 2 (of 4 bands). Above you opened and explored just one single band.Next, you will import all four image bands (red, green, blue and near-infrared) as an R RasterStack object. You will then plot a 3-band composite, or full color image. To bring in all bands of a multi-band raster, use thestack() function. IMPORTANT: All rasters in a raster stack must have the same extent, CRS and resolution. The stack is a good start to working with all the bands. However, if you want to plot and process the data, a rasterbrick is faster. Next, convert the stack to a brick. A rasterbrick in R, saves all of the bands in the same place making it faster when you process the data. You can view the attributes of each band the stack using naip_csf_br@layers. Or if you have hundreds of bands, you can specify which band you’d like to view attributes for using an index value: naip_csf_br[]. You can also use the plot() and hist() functions on the RasterStack to plot and view the distribution of raster band values. View attributes of one band. You can view a histogram of each band in your stack. This is useful to better understand the distribution of reflectance values for each band. You can plot just one band too. Use the plot() command to compare grayscale plots of band 1 (red), band 2 (green) and band 4 (near infrared). Is the forested area darker or lighter in band 2 (the green band) compared to band 1 (the red band)? Previously you’ve explored the single bands in your rasterstack. Next, you’ll plot an RGB image. To render a 3 band, color image in R, you use plotRGB(). Identify what bands you want to render in the red, green and blue regions. The plotRGB() function defaults to a 1 = red, 2 = green, and 3 = blue band order. However, you can define what bands you’d like to plot manually. Manual definition of bands is useful if you have, for example a near-infrared band and want to create a color infrared image. Let’s plot your 3-band image. col.axis = "white": set the axes to render in white. if you turn off the axes then the plot title will also be turned off. col.lab = "white": turn plot tick mark labels to white. Finally after the plot code if you set box(col = "white") it removes the line that is drawn alongside of your plot. The image above looks pretty good. You can explore whether applying a stretch to the image might improve clarity and contrast using stretch="lin" or stretch = "hist". # what does stretch do? What does the image look like using a different stretch? Any better? Worse? 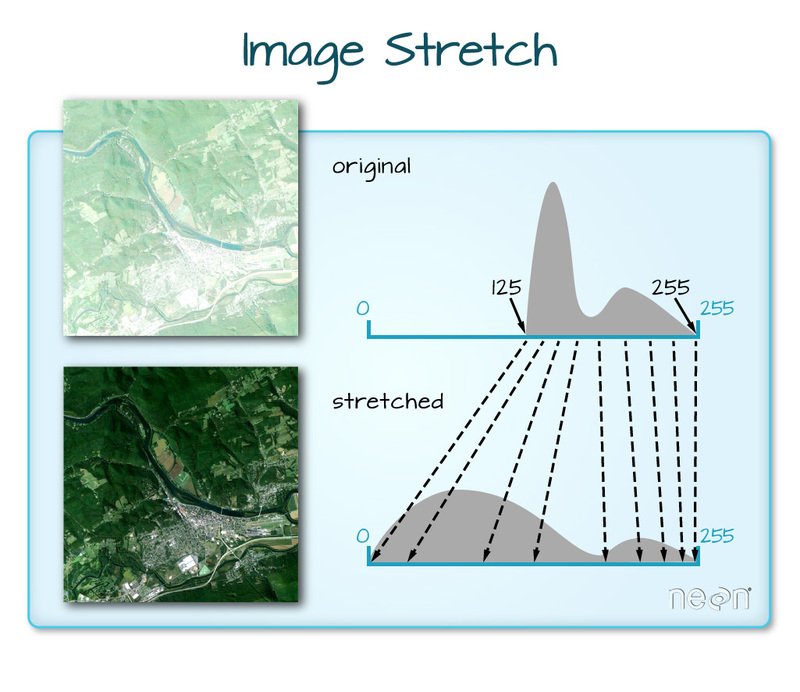 In this case, the stretch doesn’t enhance the contrast of your image significantly given the distribution of reflectance (or brightness) values is distributed well between 0 and 255. You are lucky! 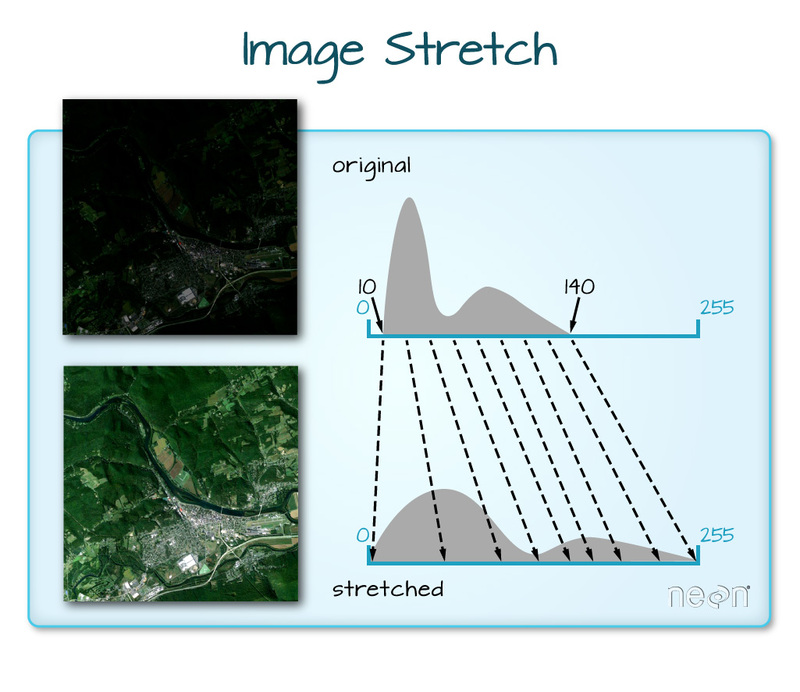 Your NAIP imagery has been processed well and thus you don’t need to worry about image stretch. The R RasterStack and RasterBrick object types can both store multiple bands. However, how they store each band is different. The bands in a RasterStack are stored as links to raster data that is located somewhere on your computer. A RasterBrick contains all of the objects stored within the actual R object. In most cases, you can work with a RasterBrick in the same way you might work with a RasterStack. However a RasterBrick is often more efficient and faster to process - which is important when working with larger files. You can turn a RasterStack into a RasterBrick in R by using brick(StackName). Let’s use the object.size() function to compare stack and brick R objects. You use plotRGB to block a RasterBrick too. How many bands does the raster have? What CRS is the raster in? What methods can be used to call on the naip_csf_st object? What methods are available for a single band within naip_csf_st?